The K35 is a good basic 27 inch tire for all-around road use. Its inverted tread pattern diverts water while good solid rubber prevents flats. A raised center tread allows speed on straights, while extra tread on the sides provides added confidence in turns. Makes a great replacement tire for an older road bike. The K35 is available in 27 x 1-1/4 Inch (32-630 ISO). Black/Gumwall. 90 PSI Max. Wire bead, Weight 500g. Holy crazy people!! These things are so so SO amazing a great buy and will be buying from yall probably the rest of the time I ride shipping was fast as all get out and very very VERY PLEASED WITH THIS ONE!!!! THANK you guys soo soo much. Great tires work very well . The only problem is that it's not really that durable, meaning that a flat would be no surprise with these tires. But for the price, the product is a great pick! Good looking bike tire for the price. very affordable. It improves the appearance of the bike greatly. Great tire all around use. I use these tires on bikes that are ridden byweekend casual rudders. A great value! I was a bit put off by these tires when I first mounted them because they did not appear to be seating evenly. I suspected that they might be slightly larger in diameter than spec. However, by deflating and re-inflating them several times I was able to mount them in a satisfactory manner. Once mounted, they have given me no trouble. I have about 375 miles on them at present - all on paved surfaces thus far. Their somewhat triangular profile appears to work well to reduce rolling resistance while the large cross-section provides the shock absorption and grip in the slippery stuff that you'd expect from a 27x1.25 tire. Ive only had these tires on for about a month now, but they seem to wear great. I notice 90 psi is recommended, but that ride was a tad too bumpy for me, 80 psi seems about right. These tires are a steal for the price and the shippping was quick. Definitely recommend the K35s for commuters! Great tires for my needs! Not an avid rider, evening rides 4 MLS. Purfect for my needs. nice thick tire that has a lot of rubber. These tires look great on my restored 1972 Raleigh 5 speed, very period. Easy mounting and nice and supple. Also a nice price! Mounts easily on the original Schwinn steel rims. While I purchased these tires to allow me to continue to use the Continental on an indoor trainer, I may actually take the bike out occasionally to just see how it rides on the street again, something it hasn't done since the 1980's. Using a bike on a trainer usually results in quick rear tire wear, but I've been pleasantly surprised at how little the rear tire seems to be wearing on the trainer, which after hours of use still shows some flashing from the molding process on the center rib of the tire. Also, I'm not finding a lot of ground up tire residue around the trainer as I did with the previous tires. These tires also preserve the look of the original skinwall tires the bike had when it was new (which was about 1970). 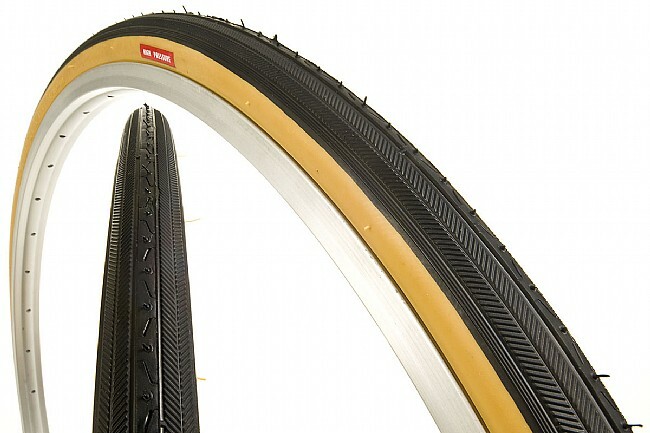 I used these new tires for an older Fuji 10 speed road bike and they ride really nice, the only thing I don't like is that gumwalls tend to dry rot after 2 or 3 years. I bought a old Schwinn 10 speed. Wanted the tires to look original. Ordered them and they look great. Rides smooth. HAVE ORDERED THESE TIRES MANY TIMES AND HAVE ALWAYS BEEN PLEASED! Good tire for the price. Good tire for the price very quick shipping.